Photograph courtesy Danny Preston, collection Neil Johnson. 24128 at Dundee on December 2nd 1973. The locomotive still sports the twin sealed beam headlights, it has the beefed up blanked off headcode panel cover and has the solid boiler room blanking plate. It has acquired a vertically hinged battery isolating switch cover, a modification unique to the Scottish Class 24's, it is also missing a sandbox. The fifteen year eleven month career of D5128/24128 was spent allocated only to Scottish Region depots. Boiler Room Blanking Plates: solid plate. Time between withdrawal & scrapping: 15 months. May 1976 to store (serviceable). After withdrawal 24128 was stored at Carstairs from July 1976 to August 1977 when it was moved to Doncaster Works (the locomotive was sidelined at York during this move) and broken up by October 1977. Movement: Carstairs - Doncaster Works via ECML (noted York September 15th 1977): 24009, 24128 & 24147. Noted Inverurie Works August 1968. Passengers on August 7th using the 10.30 Glasgow Buchanan St - Dundee relief found D7520 in trouble soon after departure, failing in Buchanan St tunnel, having the indignity of being shoved to St Rollox depot by D3901, the station pilot. Here D5128 replaced the defective unit, making the run to Dundee without further incident. The stock was quickly returned for Glasgow to provide another relief to Dundee, with D7520 as power!! Although the departure was fifteen minutes late D7520’s progress was much improved this time around. June 7th saw the end of regular steam hauled passenger service into Scotland with the 20.32 Carlisle - Perth succumbing to diesel power, Type 2’s being the norm, recent examples being ScR based D5054 & D5128. Timetable changes (?) beginning in May brought Inverness based Class 24’s to the Waverley route, possibly on layovers between trips from the Highland capital. One of the diagrams involved the 07.06 ex-Edinburgh, 13.00 ex-Carlisle, 17.54 ex-Edinburgh and the next days 09.20 ex-Carlisle. Most times a single machine sufficed, noted were D5125 (8th), D5122 (9th) & D5115 (10th & 11th). However D5128 & D5071 (64B) double headed on May 24th. Condition May: green livery with small yellow warning panels, curved upper corners, warning panel may cover the frame level stripe, tablet catcher equipped, steam style shed plate on cabfront, gangway doors present with substantial weatherstripping, headlights fitted, shortened fuel & water tanks, no blanking plates fitted, hand/footholds present, cantrail water filler not sheeted over, three-rung bogie mounted footsteps, ridge sided sandboxes, no miniature snowploughs. Condition September: blue/yellow livery, gangway doors present with substantial weatherstripping, headlights fitted, steam style shedplate on cab front, 'D' number prefix, small BR emblem on bodyside, shortened fuel & water tanks, no blanking plates fitted, hand/footholds present, cantrail water filler sheeted over, three-rung bogie mounted footsteps, ridge sided sandboxes, no miniature snowploughs. Condition no month: blue/yellow livery, gangway doors removed, headlights fitted, shortened fuel & water tanks, both with circular gauges, no blanking plates fitted, hand/footholds plated over, cantrail water filler sheeted over, three-rung bogie mounted footsteps, ridge sided sandboxes, three-piece miniature snowploughs. Condition May: blue/yellow livery, gangway doors removed, headlights fitted, shortened fuel & water tanks, both with circular gauges, solid blanking plates fitted, hand/footholds plated over, three-rung bogie mounted footsteps, ridge sided sandboxes, three-piece miniature snowploughs. 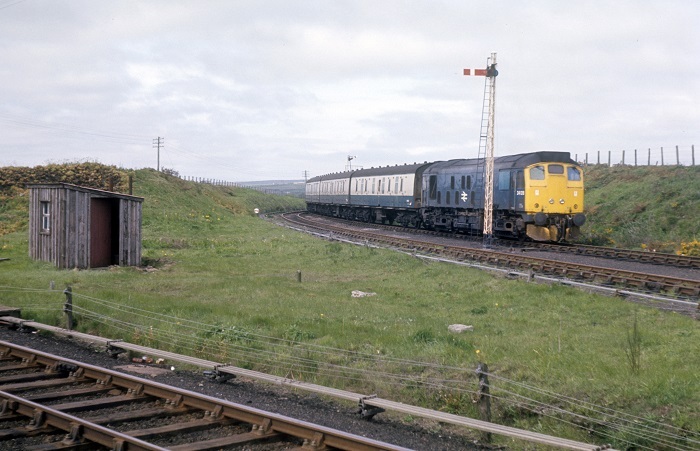 On May 25th the Wirral Railway Circle's 'Great Britain' charter ran to Wick & Thurso, 5128 was working a Thurso branch passenger service this day and additionally was required to work the Thurso portion of the charter between Georgemas Junction & Thurso (see image below). Photograph courtesy Bernard Mills. 24128 at Georgmas Junction on May 25th 1974. 24128 was still headlight fitted during June. Scotland was still host to Class 24s on a variety of passenger workings, on October 6th 24128 worked the 17.30 Edinburgh – Cardenden. 24128 was stabled on Haymarket at lunchtime on May 2nd. Withdrawn Class 24s 24009, 24128 & 24147 were noted at York on September 15th en-route from Carstairs to Doncaster Works. 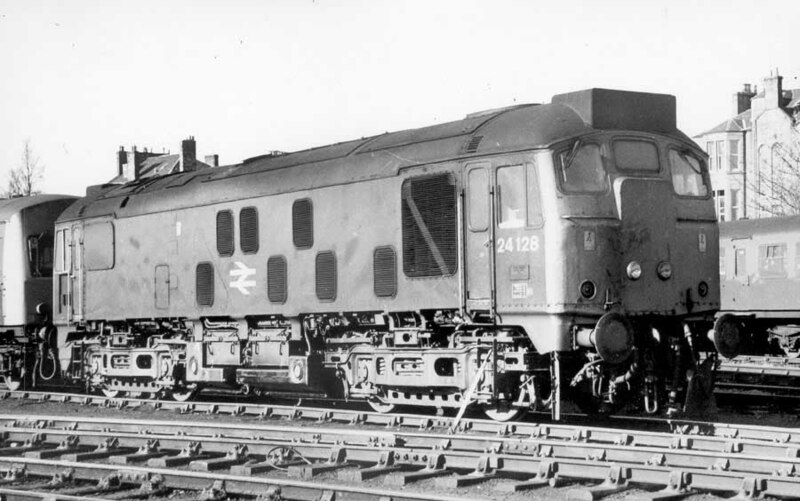 This movement would have cleared Carstairs shed of its dumped Class 24s. Condition final: blue/yellow livery, gangway doors removed, headlight location sheeted over with circular plates, shortened fuel & water tanks, both with circular gauges, solid blanking plates fitted, hand/footholds plated over, three-rung bogie mounted footsteps, ridge sided sandboxes. Page added July 26th 2016.